Our Beautiful Blessings! : The Best Half Christmas Present Ever! 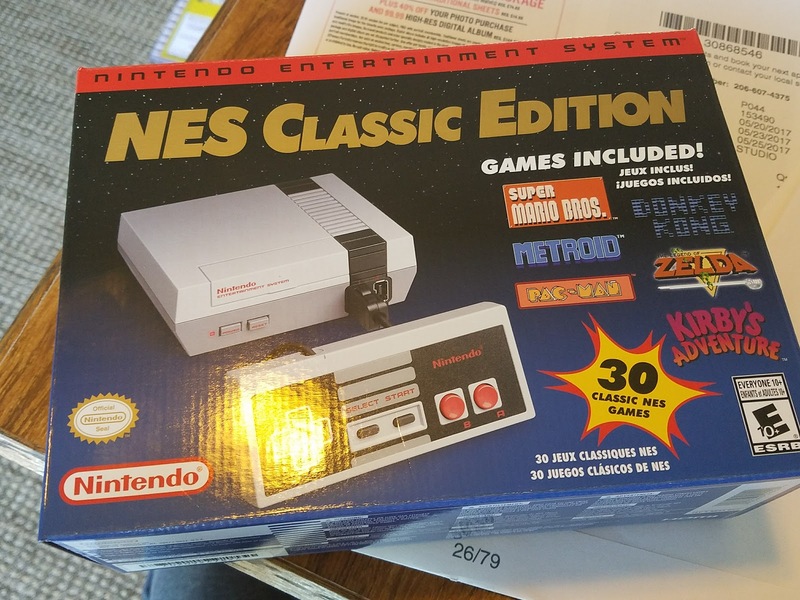 For Christmas my mom knew I really wanted the new Mini NES Nintendo. When I was younger I saved up over $100 to buy myself the original and I loved it. Of course I got rid of it along the way if I remember correctly the cord broke and my parents didn't know you could buy a new one or they were just happy to get rid of it. 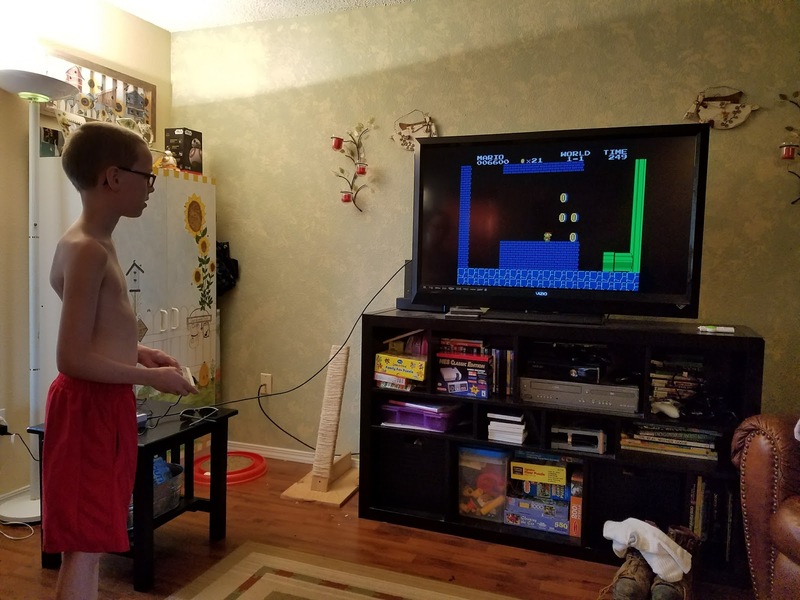 About 10 years ago Michael bought me an original Nintendo off Ebay. I played with it a little, but not enough to make it worth while and the bad thing was you couldn't save your game so I was having to leave the machine on for days on end. When I heard that Nintendo was making these I was so excited!!! Of course they were THE hot item for Christmas and mom could not get her hands on one. So she gave me $60 so I could buy one for myself when they finally made more. A couple months after Christmas I actually called Nintendo to see if they knew when stores were going to get more. They didn't have an official word at that time. I had checked with a source of mine that used to work at Nintendo and she had given the one she got....every employee got one system....to family. So I just waited. Then a couple weeks ago I read an article that Nintendo wasn't going to manufacturer anymore. It was mainly just a gimmick to get people interested in the Nintendo brand again because they were coming out with Nintendo Switch. I was so upset! 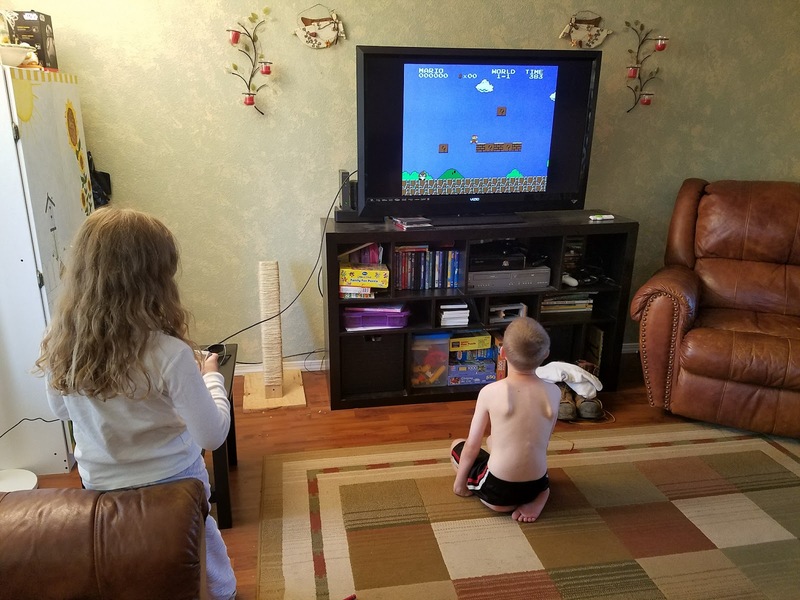 There are so many of us from the 80's that grew up with the old console and it's nostalgic for us. I get it from a business standpoint, but I was still disappointed. Later I got to thinking it's been 6 months since Christmas maybe the family member my contact from Nintendo gave hers to would be okay if I borrow the system. I mean I know that it's probably going to be one of those things where we are excited about in the beginning and then play it less and less. It's okay if we don't actually own one. 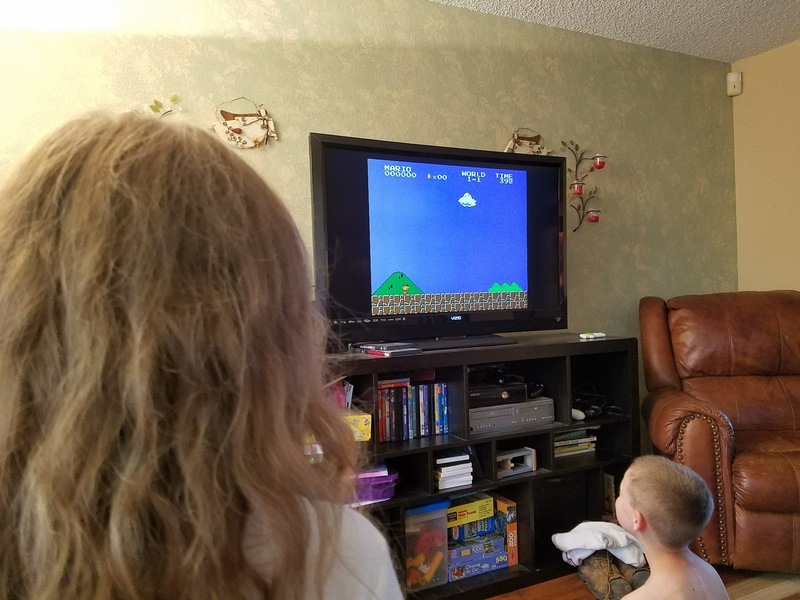 I mainly wanted an opportunity to show my kids what games I grew up playing. I contacted her and unfortunately the family member I thought she gave it to wasn't actually the one she gave it to. The one she gave it to lives out of state. Well there goes that idea....there was no way they were going to ship it up here to me. She told me that she would see if Nintendo had an refurbished consoles that she could get her hands on. The next day I got a text and they didn't have any. I had pretty much given up the idea that I would ever get one. I thought I might check on FB to see if any of my local friends had one I could borrow, but I wasn't in rush to do that. Then the next day I got a call from my friend and she ended up finding one for me. I have no idea what she had to do or how many people she had to contact, but she found me one...brand new in the box for the original price....actually a little less really. I only paid $58.40 and they sold for $59.99 plus tax! I was so excited and thankful! My parents picked it up from her for me and brought it to be on Sunday June 25th. I posted this picture on FB and one of my friends said it was funny because it was Jesus' half birthday....happy half Christmas to me!!! We were so busy so we didn't actually hook it up until Tuesday the 27th. It was perfect really because we were home all day. We had spent the morning having our clean slate day....that's a day we have every year once summer vacation starts. As a family we go room to room cleaning every room thoroughly until the whole house is clean. I always feel so good afterwards!!! It was so fun to get to show the kids the games I used to play with. They were excited to see Mario! If you've read any reviews than I'm sure you've heard how ridiculous the cords are. They are so short. We had to move the end table closer to the TV to have the console sit on and then we can't even be right in front of the TV to play we have to be off to the left or we will pull the console off the end table. It's comical really. At first I thought I would just hook it up to my computer so that wouldn't have been an issue, but it's way more fun on the big TV. There are cordless remotes so we might buy one of those....we'll just have to see how much it gets played with. It has been fun to play those games I spent hours playing when I was younger. It's fun to seeing how much I remember and then rediscovering things I've forgotten. We really didn't have that many games when I was growing up so a bunch of the 30 games I've never played before. So far Jackson seems to be the most interested in it. I've played a few times and I stink! Hahahaha! It will take some time for me to get my skills back I guess. When I was playing Castlevania with Jackson I was getting so stressed out...mainly due to the music. I finally had to walk away because my anxiety level had just got too high. I'm sure there will be many hours of entertainment for our family and I'm so grateful to my friend for finding one for me!! !